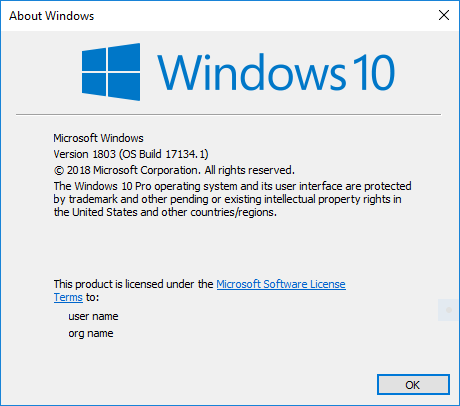 Microsoft has published the official ESD images of Windows 10 April 2018 Update OS Version 1803 Build 17134, the new name for now demoted Windows 10 Spring Creators Update Build 17133. The ESD files are the official source for upcoming major Windows 10 feature update that is delivered via Windows Update (WU) or for creation of ISO images or upgrade via Media Creation Tool (MCT). The publication of the various ESD files confirms that new Windows 10 Build 17134 (or more specifically 17134.1), which was earlier released to Windows Insiders, is the official RTM version of Windows 10 April Update v.1803. These ESD files download links can be viewed from the products.xml for Media Creation Tool of Windows 10 Build 17134.1, which provides the information about files and download links for MCT to work (see trick to get Windows 10 v.1709 Fall Creators Update ISO). The following editions of Windows 10 April 2018 Update v.1803 Build 17134 are available for download from Microsoft server in ESD file format, which can be converted into bootable ISO file format. Thus, now you can download the ISO images for RTM version Windows 10 April 2018 Update and perform an upgrade even if you’re not Windows Insider. To download ISO images for Windows 10 April 2018 Update version 1803, download the Products_RS4_04_20_2018.xml. Locate the direct download link for the language, architecture and edition of Windows 10 that you want, and open its URL in FilePath in any web browser to download the ESD file. Once you get the ISO for Windows 10 April 2018 Update v.1803, you can burn it to DVD disc or USB flash drive, and use it to install or upgrade to the latest version Windows 10 April 2018 Update. If you dislike using third party tool, you can use Microsoft’s Media Creation Tool to download or upgrade to Windows 10 April 2018 Update v.1803 now.